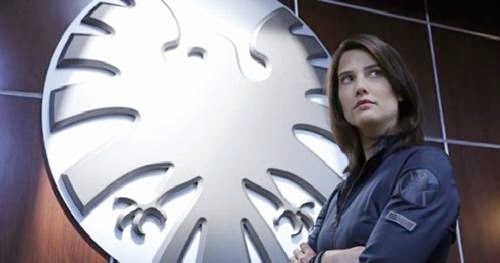 AGENTS of SHIELD Recap, 4-29-14, "Nothing Personal"
Events in Captain America The Winter Soldier have dictated a lot of what's now happening in AoS, and it explains why the front half of the season was such a lackluster bore. They were biding time until Cap 2 events could be taken advantage of in the show. In tonight's episode, all kinds of reveals took place, for characters and viewers alike. Ward had Skye, she faked him out, got the cops to show up, but it's Ward. He's super skilled fighter dude, so that didn't do any good. Deathlok showed up to back up his failed efforts to get Skye to talk, and his methods seemed to work. But even though Skye did decrypt the hard drive, she left them a present. May found the truth about the TAHITI project. Coulson and the gang finally put it all together that Ward is Hydra, (or as Skye called him, a NAZI), and that they're starting to realize more and more how alone they are. Maria Hill showed up and though initially she showed up with the military in tow, once she learned of Ward's deception, she helped Coulson turn the tide on the military dudes and they went off to find Ward. May returned to the fold... or at least I think she did. She showed up in the last scene, to show Coulson what she learned about Project TAHITI. And that's when we learn details about TAHITI, that Coulson was part of the program and that he was resigning because the side effects of using the alien blood is too unstable unless they wipe recipients memories. OH, and the program was originally designed to resurrect fallen Avengers. The other huge Marvel Cinematic Universe nuggets that we were fed. One was a reference to "What's a Man-thing?" in a telephone conversation with Pepper. You do know that's the second time we've seen reference to the guy? In Iron Man 3, the girl that Tony Stark blows up at the bar was named Ellen Brandt. That's the Man-Thing's ex-wife. The character in IM3 even had the correct scars on her face to match up with the character. Scars she got from fighting her ex-hubby. Word on the street is that Lionsgate owns the rights to the character, but there's conjecture that since we've seen two references, maybe something is up. The other nugget was from a statement Maria Hill made to May, stating that she works for Tony Stark and that with his resources, he's "privatizing global security." To me, that says (I am hoping) that in the next Avengers movie, it's very possible that we'll see Tony Stark, the head of the new SHIELD, or something like that. That was a story arc in Marvel Comics, so hey, nuggets here and there, well, we'll see how that pans out. Plus with the Man-Thing references, who knows. Whether it be in the Avengers, Guardians of the Galaxy or even in the Marvel Netflix productions (That take place in the same Marvel Cinematic Universe), I won't be surprised to see more things come together. It's pretty exciting.